Happy Saturday! Hope everyone is having a great weekend. Me, well, not so much. I am really stressing about a half marathon I’m running tomorrow morning from a combination of issues. The weather is a huge factor, it has been raining, very windy, and stormy here most of this week with flooded areas. Again, great for California! Not for running half marathons! We have another massive storm moving in today with more strong wind and rain that will rain non-stop into the race tomorrow morning. They already re-routed the race course to avoid areas that will be flooded and it’s showing %100 rain and wind for the entire race which sounds like %100 hell to me, I’m not a fan of being freezing and wet! Then there’s losing an hour with the time change! It’s also been a crazy, stressful week where I’ve been having problems sleeping maybe worrying about the race and other things. It’s the perfect storm of conditions that make me what to bail. My mom’s cat does not have any stresses, he’s been camping out in his warm bed with all the wet weather. 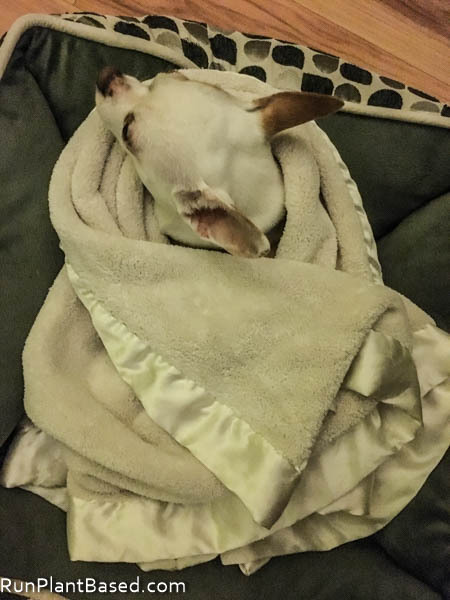 Same for Miko, perfectly happy to be bundled at home. And stay parked in his favorite bed under our desk. 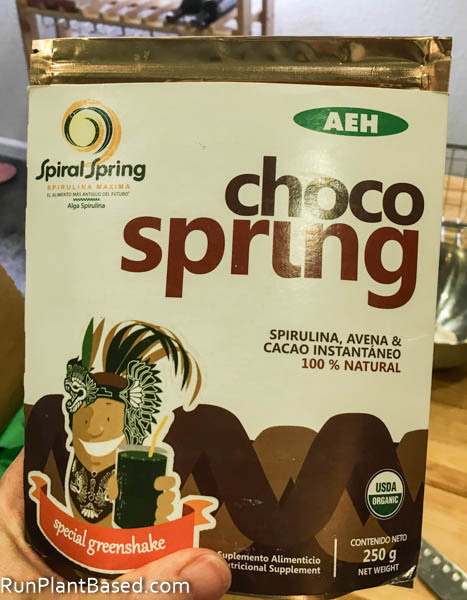 I have a new ingredient to try in my smoothies – Spiral Spring’s Choco Spring spirulina powder blend. 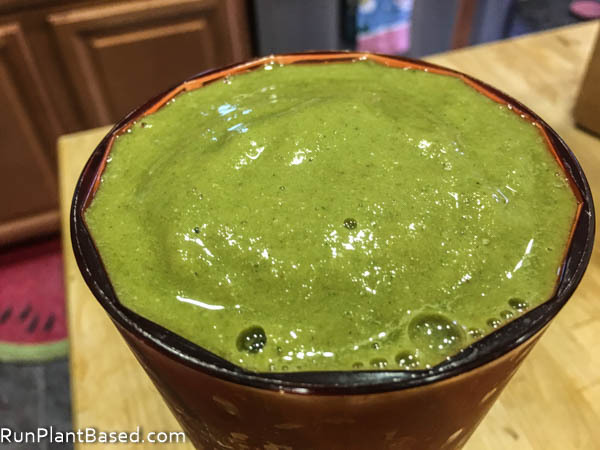 I like the simple list of ingredients in the powder from oats, spirulina, cinnamon, and cocoa and that it adds a sweet spiced chocolate flavor and a vibrant green color to smoothies. Hopefully it helps fuel me through the half tomorrow! 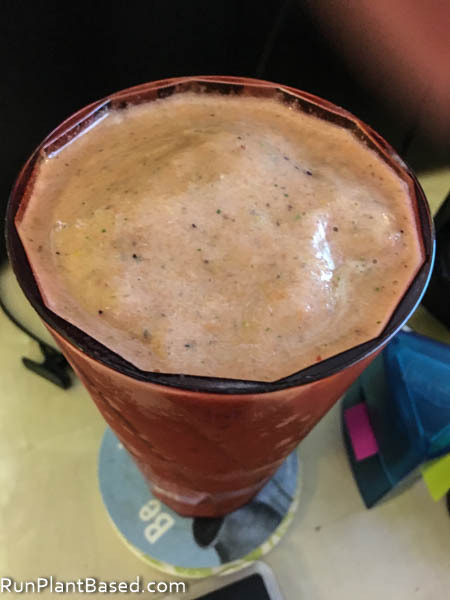 I’ve also been getting creative with ginger and fennel seed smoothies, this one has oranges, banana, kale, golden beets, carrots, and protein powder for a good flavor combo. 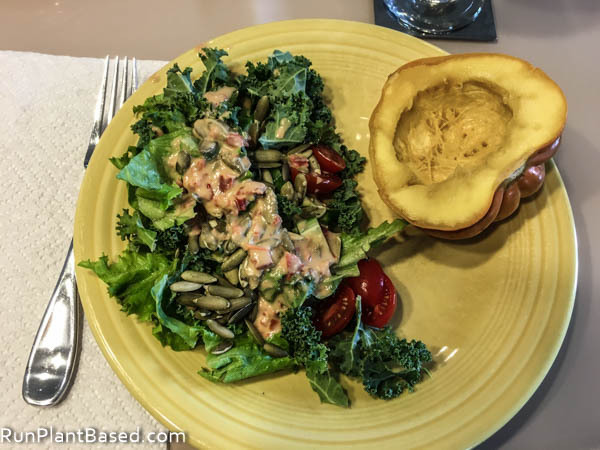 Other eats included this kale salad combo with hummus dressing and steamed acorn squash for lunch. 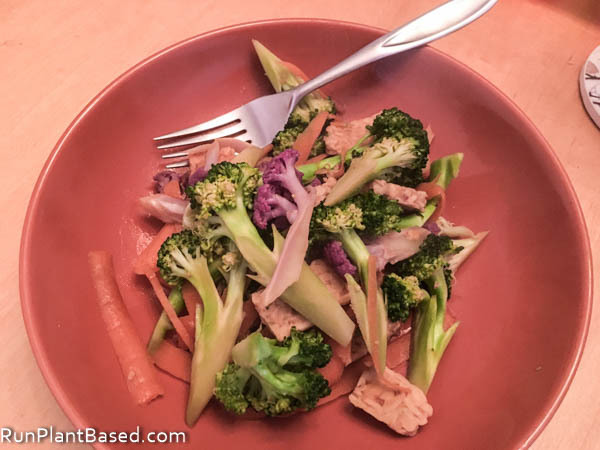 Simple and lazy oil free tamari tempeh stir fry. 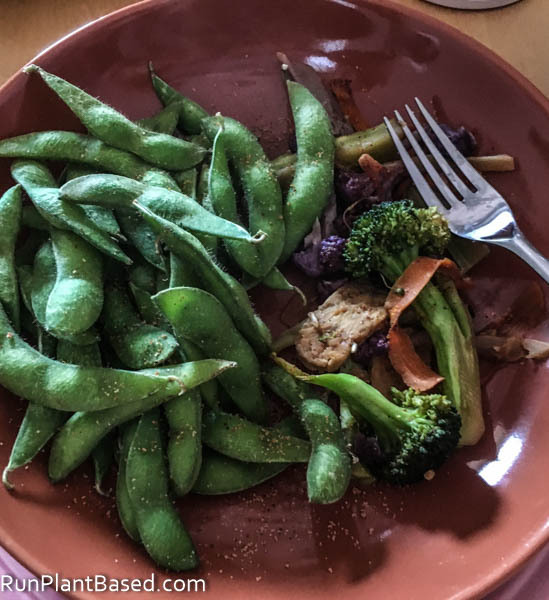 Leftover tempeh stir fry with seasoned edamame for another simple lunch. 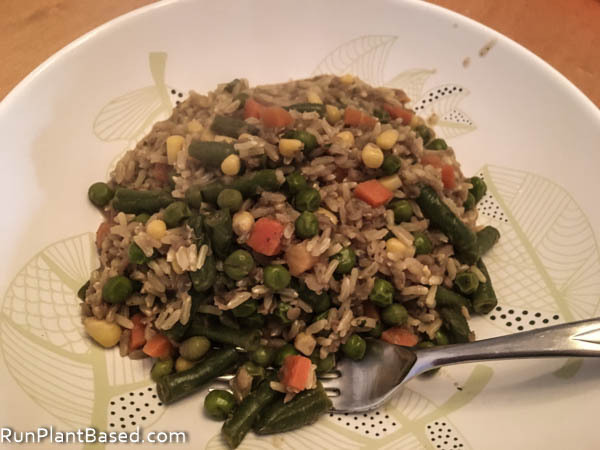 And this simple coconut curry veggie rice dish with lentils I cooked in a wok. And, ugh, I need to get to bed early for tomorrow’s rainy half marathon, but first the list! Here are some badass vegan ladies. Thanks to this Dr. Greger video, I think I will be focusing on dressings using raw garlic this week! All about good posture here and how important it is. How introverted vegans, like myself, can be activists. 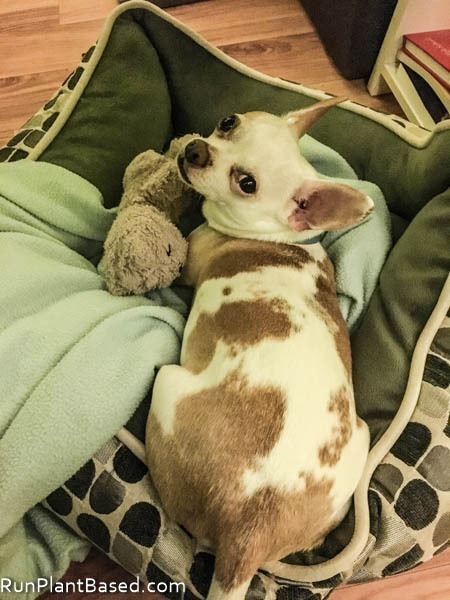 This is such a beautiful adoption story and emotional. Another view on Ben & Jerry’s vegan ice cream. And this vegan menu sounds amazing. Of course another inspirational, life changing story. 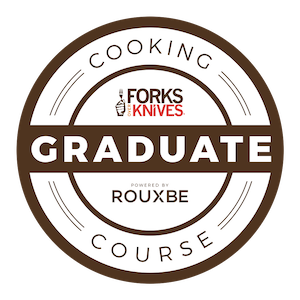 Interested in making tempeh at home? I am not looking forward to tomorrow and am packing tons of clothes, towels, poncho, trash bags, etc. to get through this with my sister and friends we registered with. It should be interesting! Would you run a race in a windy rain storm? I raced in a blizzard last year and it was an interesting experience. My shoes came untied and every person I passed told me so…but my fingers were too numb to tie them! I have actually had the same thoughts about Ben & Jerrys…so I will mostly buy So Delicious etc for ice cream. I think B&J is a good gateway for people to eat more vegan things, but the other companies we were already vegan and completely vegan will get my dollars first. Wow on racing in a blizzard, that must have been crazy! Towards the end of this half, my hands were numb just from the chilly wind! Thanks on the race! How did the race go? I hope it wasn’t as bad as it seemed like it was going to be. That new powder sounds really good. I’ve never seen it before but it sounds like something I would really like. 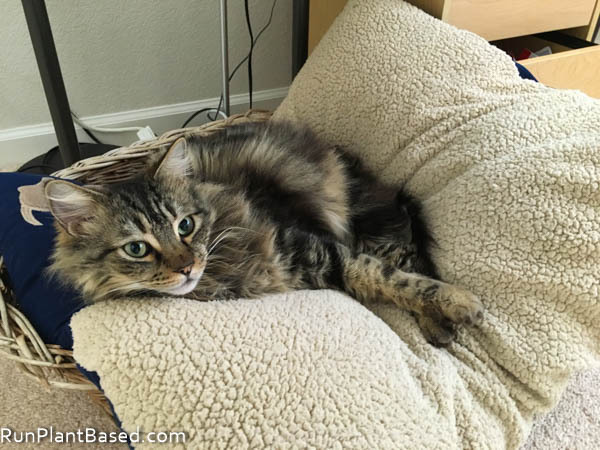 Thanks so much for sharing the introverted vegan post. I’m not much of an extrovert and although I’m trying hard to get myself out there with my blog I’m more shy in person (at least till I get to really know people). Better than expected actually! what I wore worked out okay and it wasn’t a PR, but not bad either. Same here, much more of an introvert and have to force myself into more social situations sometimes. I love all of your food pictures! I need to take more!